A couple months ago I was invited to create a piece for “Seeing Red,” a show curated by Jeff Hamada of Booooooom presented at Thinkspace. It is an honor to even be included in the same roster as some of these legends (?!!?) Big thank you to Jeff and Andrew! For more than a decade Booooooom has championed visual artists from all over the world, presenting a unique mix of high and low brow work from both emerging and established artists. Curated by Jeff Hamada, “Seeing Red” presents all new works from a wide array of artists who’ve been featured on Booooooom over the past ten years, and with the spirit of the site in mind, there are legendary names and relatively unknown ones showing alongside each other. Each artist was given the same challenge, to work within a 12×12 inch (30×30 cm) frame and to incorporate the color red into their work. The simple visual theme serves as a common thread connecting all the works—a pathway for the viewer to travel into and out of each piece—and provides a reference point to help understand the way this diverse group sees the world around them. 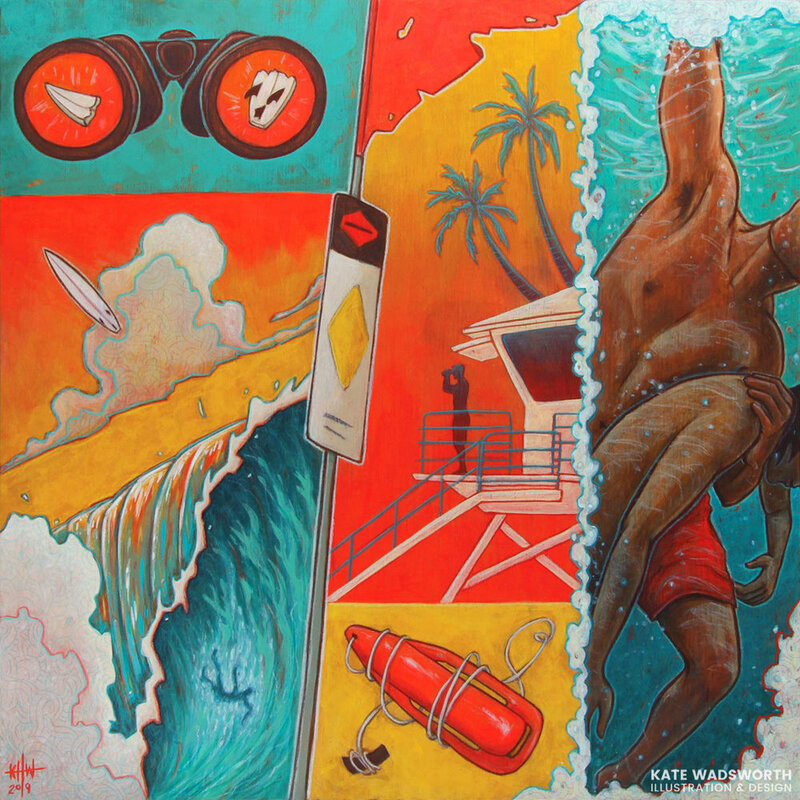 My piece is called “Lost and Found,” inspired by the surfers and lifeguards on the North Shore (Oahu, HI). I had been working on another surf-heavy project at the same time, and made a few research trips to take reference photos. The official red and yellow lifeguard colors lent themselves perfectly for this project, as I was drawing a blank for a few weeks on what to paint for this show… (the pressure!) not to mention I’m still obsessed with fluorescent red and the “High Surf” signs scattered about the the beaches. (Why? I’d tell you if I knew!) The painting isn’t necessarily sequential, but I wanted to illustrate enough little bits for the viewer to piece together their own narrative. If you’re in the LA area, I hope you can make it to the show! COPYRIGHT © 2018 KATE WADSWORTH. ALL RIGHTS RESERVED.